Spas are a great way to relax and replenish your positive energy. For those times where a spa is necessary, a spa day at home is a wonderful alternative. Instead of spending money to drive to the spa, have a spa day at home. Since women and men can equally benefit from it, learn how you can build a spa in your home. When you spent money on spas, what is your reason for going? Is it the same reason you need one now? If not, what is the reason? The reason will guide you toward creating the perfect in-home spa. Driving to a spa requires a date and time. Planning a spa requires additional effort. Start with gathering a comfortable robe, underwear, and slippers. Grab sheets, towels, spa CD or jazz/classical music CDs, body scrub/body wash/soap, loofah, back scrubber, facial products, hair products, and manicure/pedicure products. Add exercise clothing, exercise DVDs, exercise equipment, and a good book. From there, conjure up some healthy foods and meals. An alternative is to cook healthy meals during the spa. Choose a day that you’re free of work or errands. Clean the tub and organize everything prior to the spa day. Turn off the internet/TV and pay attention to the spa. Light the candles turn on the CD player and play relaxing music. After brushing and flossing, eat the usual three meals of the day and exercise throughout. Healthy meals are energizing foods for your body, while exercise burns calories and relieve stress. You can’t have a spa day without a hot tub. Therefore, head to the bathroom sometime during the day. Get the tub set with your favorite body scrub/soap/body wash. Turn on the cold and hot water to fill the tub to the desired amount. With the robe, underwear, slippers, towels, loofah, and back scrubber near the tub, undress and step inside. Dry yourself off and slip into your robe, underwear, and slippers. After a relaxing hot bath, wash your hair. Wrap your hair in a towel and give yourself a facial. Afterward, give yourself a manicure and pedicure. Wash your face. 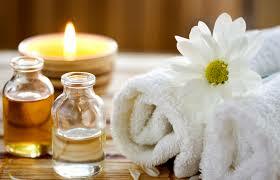 Alternately, you can rub oils, place hot towels on pressure points, or create a foot soak to soothe muscles. Consider shaving your legs during the spa treatment as well. The final spa phase is to acquire and enjoy the peace and quiet environment. Turn off the music and turn on a good book. Another idea is to sit down and let your senses soak in the spa treatment and the sounds outside. Remain quiet as your senses channel your thoughts. End the day sleeping in bed. Customize the spa to your liking. As long as you represent each component, you may add or eliminate undesirable pieces. Gather the materials necessary to create a spa day you’ll enjoy. An in-home spa cranks the comfort level on high. After all, the home provides a great atmosphere to set any mood you wish. A successful spa encourages you to think clearly, love yourself, and love others without physical, mental, spiritual, and emotional pain.